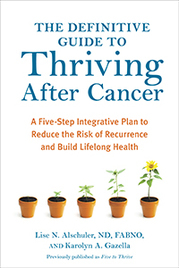 Co-Author with Karolyn Gazella, The Definitive Guide to Thriving After Cancer: A Five-Step Integrative Plan to Reduce the Risk of Recurrence and Build Lifelong Health, Random House, 2013. Integrative Treatment Considerations for Cancer-Treatment Related Cognitive Dysfunction, Townsend Letter, Apr 2015. "Natural Interventions for Post-Treatment Cancer Related Fatigue," Natural Medicine Journal, Nov 2014. “Uprooting Anxiety”, NDNR, 2014, March issue. Treatment Considerations for General Anxiety Disorder, Natural Medicine Journal, Apr 2014. “Transforming the Milieu of Cancer” editorial, Global Advances in Health and Medicine, 2012, vol. 1, no. 5. “Optimal Longevity hinges upon Telomeres,” Natural Medicine Journal, 2013, vol. 5, issue 6. “Breast Cancer: An Integrative Perspective,” Townsend Letter for Doctors, 2013, April issue. “Transforming the Milieu of Cancer,” editorial, Global Advances in Health and Medicine, 2012, vol. 1, no. 5. Co-author, “Integrative Tumor Board: Pancreatic Cancer. Naturopathic Medicine,” Integrative Cancer Therapies, June 2008, 7(2):105-108. Co-author with Sherry Torkos of Immunity, Active Interest Media publisher, 2008. Naturopathy, Active Interest Media publisher, 2009. 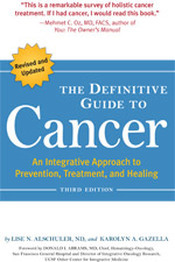 Co-author of Naturopathic Oncology and Botanical Oncology chapters in Integrated Oncology, editors Abrams and Weil, Oxford University Publisher, 2009 and 2nd edition, 2014. Author of Cervical Cancer chapter in Integrative Women’s Health, editors Low Dog and Maizes, Oxford University Press, 2009, 2nd edition 2014. Contributing author of Apoptosis Assessment and Cell Signaling Analysis chapters in Textbook of Natural Medicine, 4th ed., editors Pizzorno and Murray, Elsevier Press, 2013. Contributing author on the topic of Botanicals in Integrative Oncology: Principles and Practice, ed. Matt Mumber, MD, Taylor & Francis publisher, 2006. Co-Investigator: Effect of complementary alternative medical (CAM) therapy on pain and fatigue in pancreatic cancer patients. Accepted poster at American Society of Clinical Oncology (ASCO) Gastrointestinal Cancers Symposium, Jan. 2008, Orlando, FL. Co-investigator and author: Quality of Life Outcomes in an Integrative Cancer Treatment Setting: the Cancer Treatment Centers of America Experience: CTCA Outcomes Study presented at the 3rd International Conference of the Society of Integrative Oncology, Nov 9-11, 2006, Boston, MA. Co-investigator and author: Effect of Concomitant Naturopathic Therapies on Clinical Tumor Response to External Beam Radiation Therapy for Prostate Cancer presented at the 3rd International Conference of the Society of Integrative Oncology, Nov 9-11, 2006, Boston, MA.